ATLANTA — For the second-straight day, No. 10 Florida State (46-10) fell behind early at the ACC Championship, but scored the final six runs of the game to take a 6-1 win on Friday over Notre Dame (32-21) to advance to Saturday’s 2018 ACC Championship Game. Florida State will play in the ACC title game for the sixth year in a row and will play No. 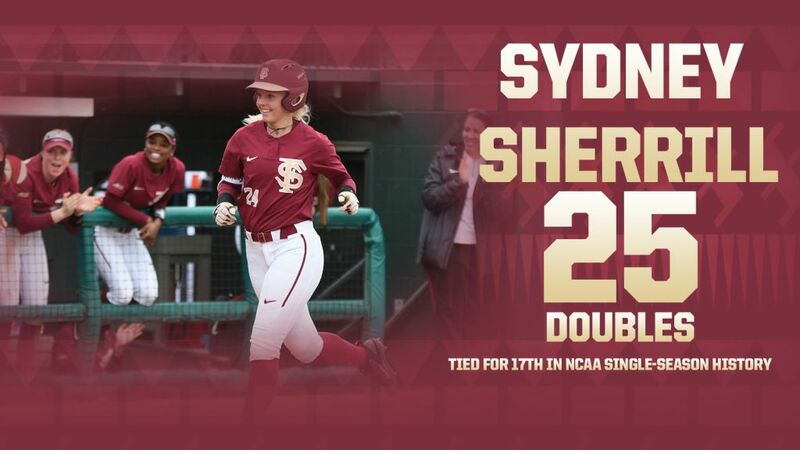 2-seed Pitt on Saturday, May 12 at 12:00 p.m.
Sydney Sherrill went 2-for-3 at the plate and hit her 25th double of the season, extending her FSU record and moving into a tie for 17th in NCAA single-season history. The Seminoles threatened in the first inning, loading the bases with one out on walks by Carsyn Gordon, Sherrill and Zoe Casas, but a fly out and a strikeout ended the inning. Cali Harrod led off the FSU second inning with a double and moved to third on a sacrifice bunt by Anna Shelnutt. Morgan Klaevemann followed with a bunt single in front of the plate and took second on the play as the base was vacated. Both were left stranded after a pop out and a strikeout. FSU starter Meghan King faced the minimum through the first two innings before allowing a solo home run to Sara White to start the top of the third. Florida State took the lead in the bottom of the third as Sherrill led off with a double to left center. Casas tied the game with an RBI triple to right and Dani Morgan put the Noles in front with a single to center with nobody out. Morgan stole second and moved up to third later in the inning on a ground out. Shelnutt made it 3-1 Seminoles with an RBI single to left. FSU added another run in the bottom of the fifth inning as Casas led off with a walk and was pinch-run for by Korina Rosario. Morgan added an infield single and a groundout moved the runners to second and third with one out. Harrod hit a ground ball to the circle, and ND pitcher Alexis Holloway threw back to third to retire Rosario. The play continued as ND third baseman Melissa Rochford attempted to double off Morgan, but her throw went into right field, allowing a run to score and extend the Seminole lead to 4-1. King retired eight batters in a row until allowing a one-out single to Ali Wester in the top of the sixth inning. She was replaced in the circle by Kylee Hanson after a walk placed ND runners on first and second with two outs and Hanson ended the inning with a strikeout. The Seminoles added two more runs in the bottom of the sixth for the 6-1 final score. Klaevemann opened the inning with a single to right and stole second with one out. She came in to score on Gordon’s RBI single to left field. Gordon stole second and moved to third on an ND throwing error before coming in to score on an RBI single by Sherrill, her 46th RBI of the season. Hanson allowed one runner in the seventh on a one-out hit-by-pitch, before a groundball up the middle was grabbed by Harrod, she stepped on second and threw to first for a game-ending double play. It was FSU’s third double play of the game. Hanson picked up her second save of the season, striking out one and facing the minimum over 1.1 innings with no runs, walks or hits allowed. King (19-6) earned the win with 5.2 innings of work, allowing just one run on three hits with three walks and five strikeouts. The 2018 ACC Championship Game between FSU and Pitt will be broadcast live on ESPN. Broadcast links and live stats will be available on the softball schedule page of Seminoles.com.